Dr. Maria Montessori, the Italian pediatrician who founded the philosophy, believed self-motivation to be the key to learning. Therefore, the Montessori teacher acts as a facilitator whose role is to stimulate interest in all facets of the child-centered learning environment. 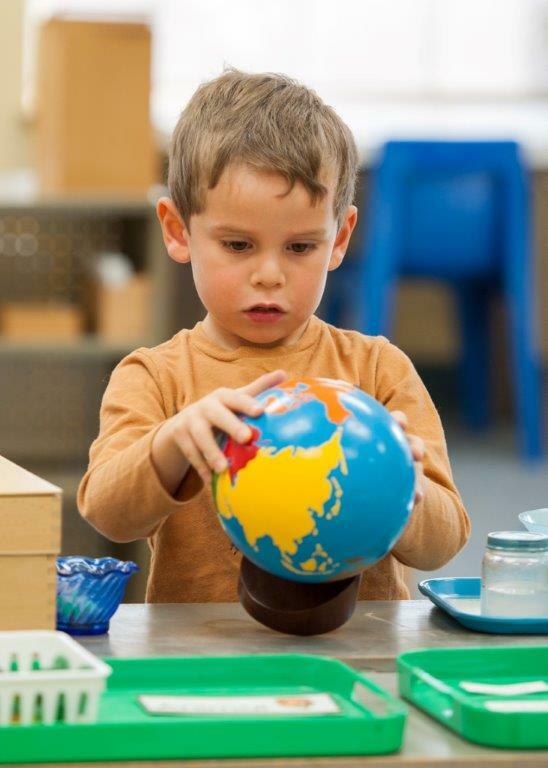 Montessori Education recognizes the importance of all developmental areas, including social, emotional, physical and intellectual needs. Teacher/Student Ratios. Our Toddler program has a teacher/student ratio of 1:6 and our Transitional Preschool teacher/student ratio is 1:8. At the Preprimary level, our teacher/student ratio is 1:10, and at the Elementary level, our teacher/student ratio is 1:15. Multi-Cultural. Over the years, our Program has become very appealing to families from many different countries, from a wide variety of cultural backgrounds. For example, during the 2017/2018 school year, forty-six percent of our school population represents minority backgrounds. This diversity is extremely valuable, enabling all of our students to learn about differences on a firsthand basis every day. Individualized Education. Our Program recognizes individual learning ability, interest, style and pace. Students are not restricted to grade level curriculum. Positive Self-Esteem. We encourage independence and initiative. Respect. We instill consideration for one another and the environment. Structured Environment. Our Program creates a structured environment, within which freedom of choice flourishes. Multi-Age Classrooms. At all levels, students benefit from classes that host children of different ages. Ours is a nurturing environment in which we use a positive, gentle and consistent approach with all the students. We emphasize the use of uniquely designed Montessori Materials. These materials are manipulative; the students learn by doing. The materials are carefully sequenced to lead a child from simple concepts and concrete experiences to more complex concepts and abstractions.